Manhattan Toy Whoozit Activity Spiral Stroller and Travel Activity Toy by Manhattan Toy at My Pregnancy Place. MPN: 201890. Hurry! Limited time offer. Offer valid only while supplies last. 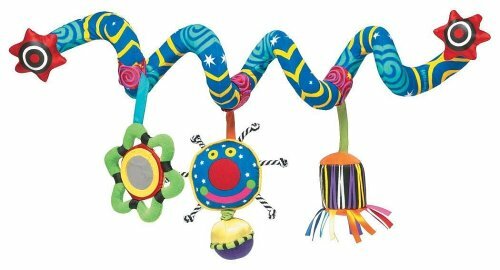 This wacky spiral wraps around almost anything and features toy attachments that squeak, crinkle, and rattle while dangling from satin ribbons. This wacky spiral wraps around almost anything and features toy attachments that squeak, crinkle, and rattle while dangling from satin ribbons. Features vibrant mixed colors, stimulating textures, and black and white patterns to please baby's early natural curiosity and blooming motor skills. Since 1979, Manhattan Toy has been making award-winning, high quality, educational toys for your baby, toddler or kid. From infant toys and baby toys to sensory development toys, our goal is to provide the safest and best toys available. All of our products, from the newest concepts to our time-tested classics, are innovatively designed to inspire imaginative play and are routinely safety tested to pass strict CPSC, ASTM, EN71 and Health Canada safety standards. If you have any questions about this product by Manhattan Toy, contact us by completing and submitting the form below. If you are looking for a specif part number, please include it with your message.